buckwheat groats. If you’re wheat, or gluten sensitive, cooking with buckwheat allows you to have all the foods you enjoy without the side effects. Buckwheat looks and acts like a grain. It’s actually a triangular seed related to rhubarb and sorrel. It’s a good substitute for wheat, or grains containing gluten. Buckwheat cooks quickly, and is highly nutritious. 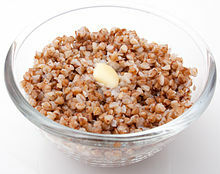 Buckwheat is sold either raw or toasted, and can be mixed with rice, or other grains. 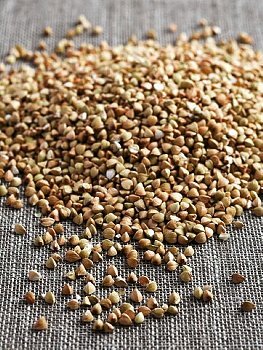 Toasted Buckwheat sometimes called “Kasha”, has a more nutty flavor, than Raw Buckwheat. Either way it’s a wonderful side dish, when sauteed with onions. Buckwheat flour is darker than other types of flour. Pancakes, and bread will not come out white. Buckwheat Bread: bake bread with buckwheat flour. Buckwheat Morning Cereal: cook raw, or toasted buckwheat seeds in water to make cereal. Add fruit, cinnamon, salt, maple syrup, and hemp milk according to taste. Buckwheat Pancakes: use buckwheat flour for morning pancakes. Pancake made from buckwheat will come out much darker than other types of flour. To lighten the color, combine with wheat, or spelt flour. Buckwheat Side Dish: combine either cooked raw buckwheat, or cooked toasted buckwheat with sauteed onions, for a delicious side dish. 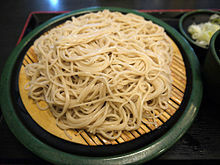 Soba Noodles: boil noodles in water. Add sauteed onions, garlic, and favorite veggies. If you can’t find it locally, here are handy links to Amazon where you can buy buckwheat to make pancakes, breakfast cereal, or side dishes. When clicking the links you’ll be able to shop around at Amazon to find exactly what you need. Posted on August 23, 2012, in Food, Recommended Products and tagged Amazon, Buckwheat, celiac, gluten free, Kasha, wheat alternative. Bookmark the permalink. Leave a comment.